Pioneer UDP-LX500 review | What Hi-Fi? 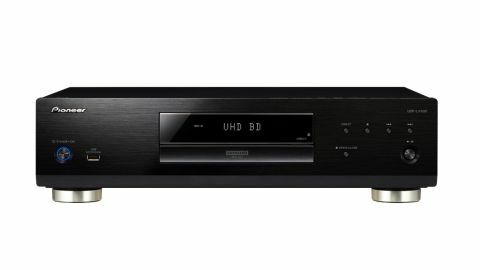 The task of justifying why you should spend nearly £1000 on a 4K Blu-ray player such as the Pioneer UDP-LX500 is a difficult one, especially when you can buy a decent quality entry-level deck for under £200. But if any AV brand can convince you to set your sights a little higher, it’s Pioneer. The Japanese manufacturer has previous form when it comes to video sources. We’ve given five stars to many of its premium disc products over the years and now, thanks to the UDP-LX500, we can add a 4K Blu-ray player to that list. When making the leap from budget to premium 4K Blu-ray player, you may expect the build quality to go up a notch and the Pioneer UDP-LX500 doesn’t disappoint. It’s solid, stable and sturdy, and designed to help reduce unwanted vibrations and outside interference. For example, the Pioneer uses a double-layer chassis that is reinforced with a 3mm steel plate for extra rigidity and to give the player a low centre of gravity. Its disc tray is suspended and acoustically damped to stop the sound from your speakers sending vibrations into the chassis. It uses a smooth mechanism that makes it a lot quieter in operation than its closest rival, the Panasonic DP-UB9000. The UDP-LX500 comes with a streamlined rectangular remote, which will be familiar to anyone who has previously owned a Pioneer player or AV receiver. The presence of a backlight is a bonus in darkened rooms and there are quick buttons to all relevant features such as picture and audio settings, HDR and picture resolution. The menu system is simpler than Panasonic’s somewhat overcomplicated one, with two menus you should investigate – Audio Parameters and Video Parameters. The latter allows you to assign preferred video settings to one of three presets. Within each you can change brightness, contrast, hue, chroma level, sharpness and noise reduction. These are useful if you want to give the content you’re watching a particular flavour. That said, we’d suggest setting it to Reference so the video signal output by the player remains untouched. It is definitely worth setting the Pioneer up for the display you’re using. You are given the option of LCD TV, OLED TV or projector. It’s straightforward and ensures the player is outputting a picture that's somewhat tailored to the screen to which it's connected. Bringing up the player’s Audio Parameters allows you to access the digital filters for the player’s internal DAC. You can choose between Sharp (which promotes a solid sound), Slow (a softer sound) and Short (a smoother sound). We settle on Sharp for our testing, but the differences are subtle so we’d recommend experimenting. The LX500 is a universal disc player, so besides Full HD, 3D and 4K Blu-rays, it can also handle DVD-Audio and SACD discs which will please some prospective buyers. To see basic information on the disc you’re watching, press the display button. A long press shows more advanced information such as the colour bit depth of the disc being played, the peak brightness and HDR format being displayed. The UDP-LX500 supports the usual HDR formats, such as HDR10 and Dolby Vision, and at the time of writing, an HDR10+ software update is promised for sometime during the Spring. As is the trend with expensive 4K Blu-ray players, there are twin HDMI outputs, allowing you to split the audio and video signals if you’ve got a suitable home cinema set-up. There’s no multi-channel analogue out, but Pioneer believes that most people buying the UDP-LX500 will already own an AV receiver with HDMI inputs compatible with the latest audio and video formats. And we’re inclined to agree. There’s no wi-fi, but there is an ethernet connection. That's really only for software updates, though, as the Pioneer doesn’t have any built-in smarts such as Netflix or YouTube. With the vast majority of modern displays now featuring these apps, we don't see that as any kind of shortfall. Owners of compatible Pioneer AV receivers will be able to take advantage of the UDP-LX500’s Precision Quartz Lock System (PQLS) feature, which allows your Pioneer AV receiver to act as the digital master clock in your system. That should mean reduced jitter (digital timing errors) between player and amp and result in improved audio. The Pioneer does have one new trick up its sleeve. On the rear panel, there’s a socket labelled Zero Signal, which is designed to ground audio and video signals and help maintain signal quality as it passes through the player into your AV receiver. Simply connect one end of a standard analogue interconnect to the Zero Signal socket on the player and attach the other to an analogue audio or video socket on the rear of your home cinema amp. We feel it adds a bit more solidity and focus to the sound, and so it’s worth trying out if you’ve got a spare interconnect lying around. Pioneer designed this player to be just as accomplished with audio as it is with video, and it shows. We start with the 4K Blu-ray of Kingsman: The Golden Circle, and as Poppy’s missile strike takes out the Kingsman headquarters the explosions sound dynamic and suitably bombastic. There’s weight and power here, but the Pioneer also keeps a tight grip, drawing crisply defined lines around rumblings as they ripple out and around your head. In the aftermath of the strike, Eggsy confronts Merlin and the Pioneer does a great job of extracting the emotion, distress and the slight hint of comedy in Eggsy’s voice. Switch to CD playback and the Pioneer sounds equally natural and effortless in its delivery. It has a fine grasp of timing and delivers a solid and robust drum beat to accompany Eminem’s White America. Hit the Direct button, which turns off all digital video and audio processing, and it adds a little extra clarity to the sound. Music sounds purer, with detail and dynamics easier to extract. Play George Michael’s Faith and there’s a nice even balance to the sound. There’s a tight twang to the guitar strums and percussion has just enough of a cutting edge to entertain without sounding too harsh. Compared to its closest rival, the Panasonic DP-UB9000, the Pioneer organises the different elements that little bit better and delivers audio with greater focus and precision. The UB9000 opts for a fuller, richer sound that is appealing in its own right. It’s an easier listen, even if it isn’t quite as convincing. The high praise doesn’t stop with the player’s sound quality. The Pioneer UDP-LX500 delivers a fantastic picture too. It’s close to that of the Panasonic DP-UB9000, but just about edges it in terms of outright detail and clarity. As Poppy’s missiles strike their targets in Kingsman, the Pioneer delivers the explosions with vim and vigour. Bursts of yellow don’t so much pierce the night sky as smash right through it. They don’t overwhelm the overall image, though, and there’s still plenty of detail in the darker areas of the scene. As Eggsy and Merlin chat amongst the ruins of Kingsman HQ, the droplets of water on Merlin’s coat are superbly defined, the punchy bright lights of nearby buildings catching the texture of his coat and the beads of water with precision. The UDP-LX500 picks out plenty of detail from all the rubble and splintered wood. Skin textures and facial stubble are treated in the same confident and colourful way. We say colourful, but there’s subtlety and neutrality too. The Panasonic DP-UB9000, on the other hand, prefers a slightly richer colour balance. Switch to the 4K Blu-ray of Despicable Me, and the Pioneer’s balanced colour palette is easy to see. When Gru is doing surveillance on Vector’s hideout, the brilliant white of Vector’s lair has serious punch, while the green, yellow and red hues on Gru’s jumper all pop out of the screen without appearing overdone. You’re able to enjoy the picture’s vibrancy without your eyes feeling strained. The UDP-LX500 is also a confident upscaler. Played through a Samsung QE65Q9FN TV, the Blu-ray of Transformers: Dark Of The Moon isn’t completely devoid of noise, but it has a firmer grasp on the picture than the TV’s built-in upscaler and there are fewer artefacts present too. Of course, the source material will always have a big say in how good the picture looks, but this machine still proves its worth. Pioneer might be a little late to the party with a 4K Blu-ray player, but the UDP-LX500 has been worth the wait. It’s one of the most expensive 4K machines we’ve reviewed so far, but if your home cinema system can make the most of its abilities, every night should be movie night. 4K streaming vs 4K Blu-ray vs Blu-ray – which is best?